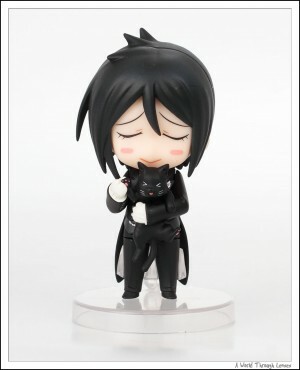 Here’s Sebastian out of the box. Sebastian cannot stand by his own legs and must be supported by the stand. 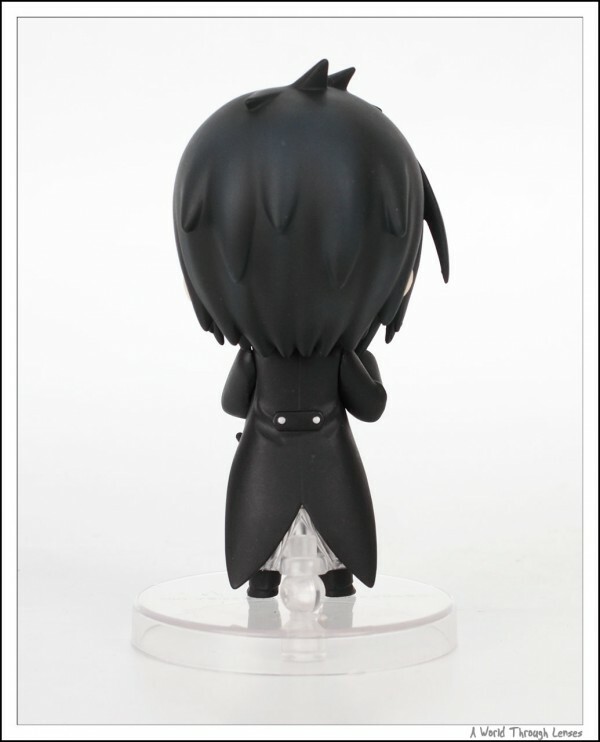 The stand holds onto his legs right between the legs and the tuxedo. 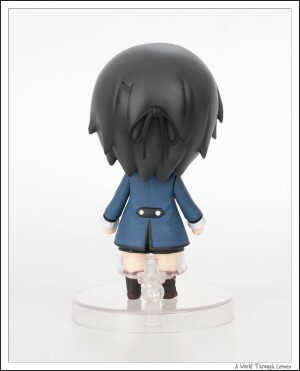 Here’s the a look from behind. Comes with two set of faces as shown below. It also comes with 3 different hand. One is a finger pointing hand shown in the photo on the left. The other is a set which is used to hold up the cat as seen in the photo on the right. 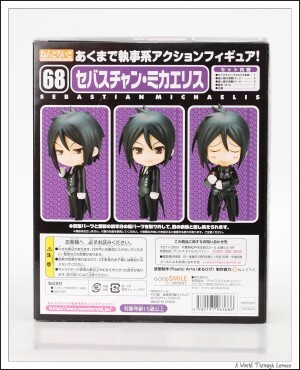 I purchased the September 2010 re-release of Sebastian but it is identical to the July 2009 release. I think the faces are fine, but definitely didn’t have enough parts to pose him as the black butler properly. 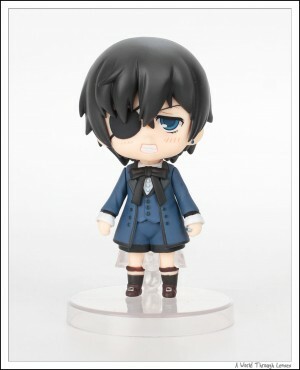 Nendoroid Ciel Phantomhive by Good Smile Company (シエル・ファントムハイヴ) Original sculptor Abe Takumi (安倍匠（カポネ団）). 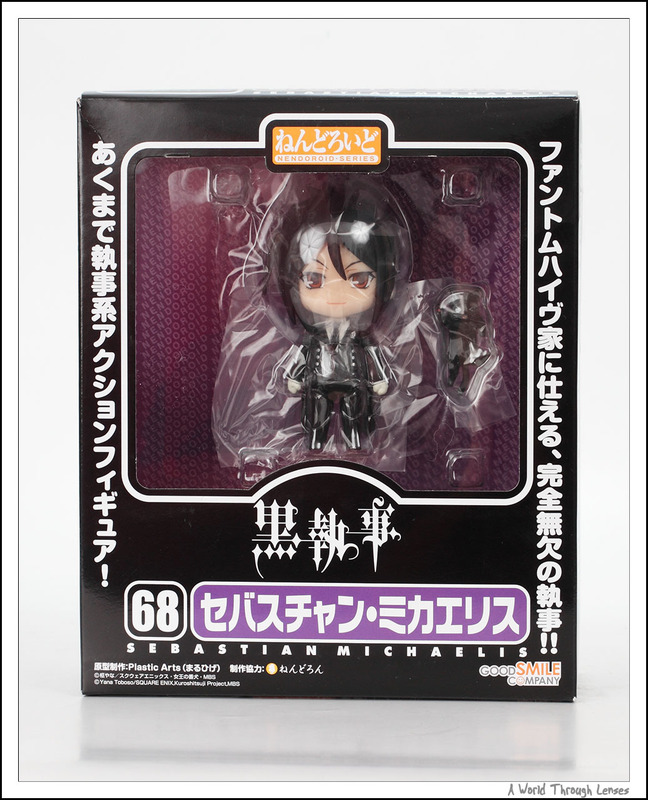 Released on September 2010 with MSRP of ¥3,500. 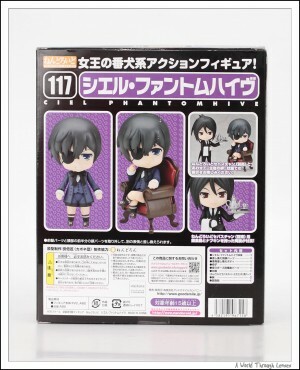 Here’s Ciel out of the box, front and back. I did swapped his embarrassed face on because I like that face better. 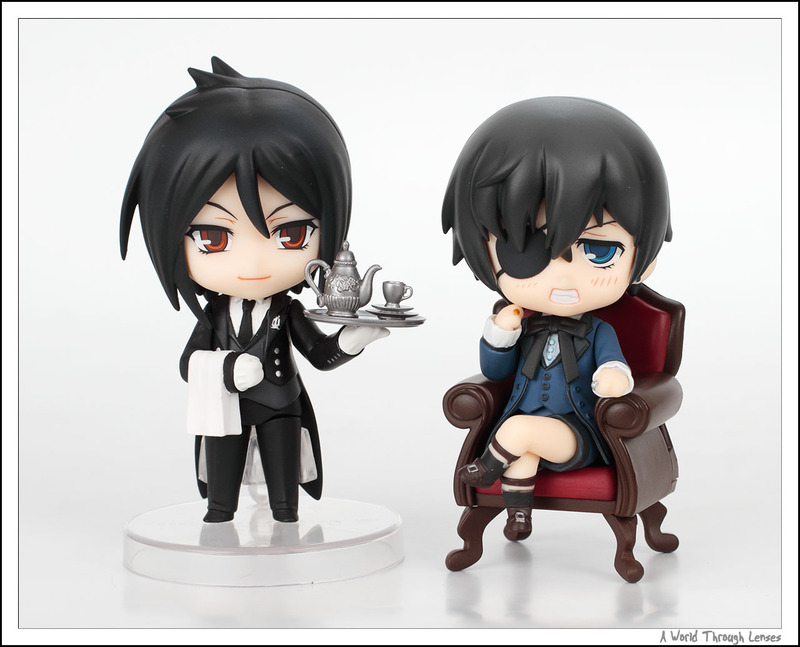 Just like Sebastian, Ciel can’t seems to stand by just his legs. So the display stand is a must. 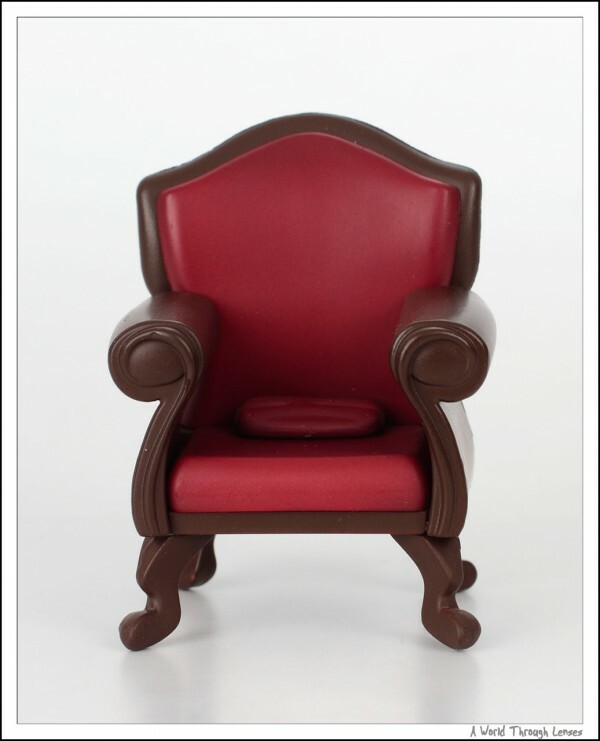 Comes with a good looking chair for him to sit in. 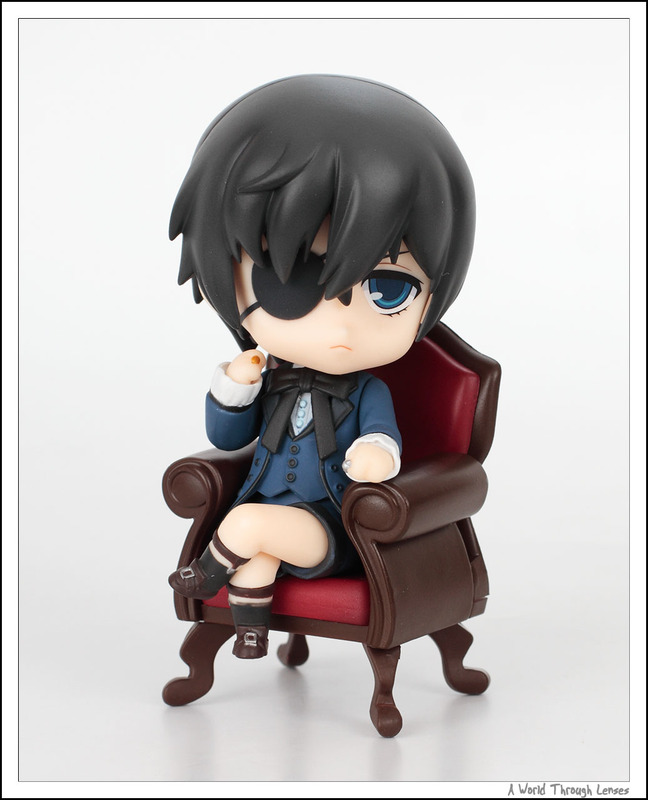 You have to switch to the sitting down body for Ciel to sit in the chair. This is unlike some other nendoroid that I owned that only supplies a set of leg parts to convert it to a sitting pose. 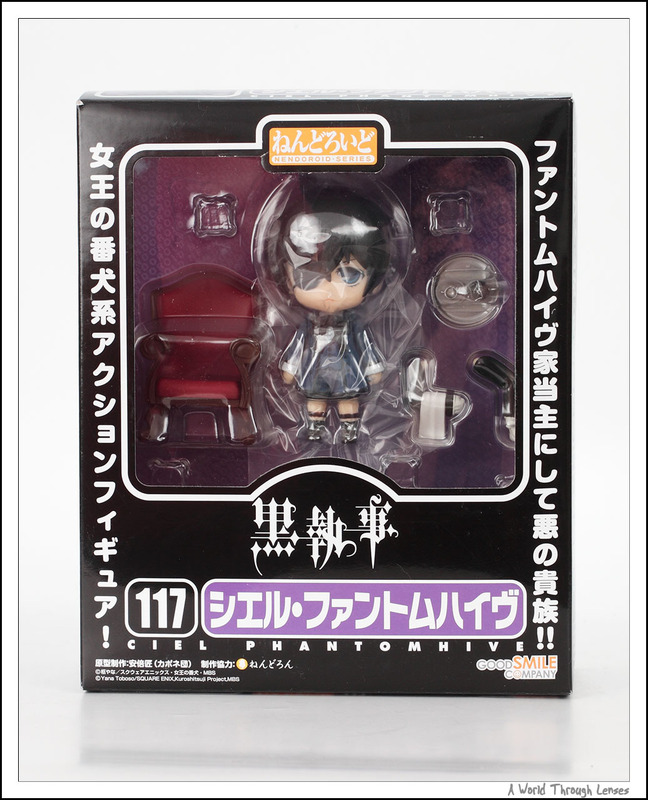 But the up side is that Ciel fits in the chair perfectly. Comes with this relaxed face as well. 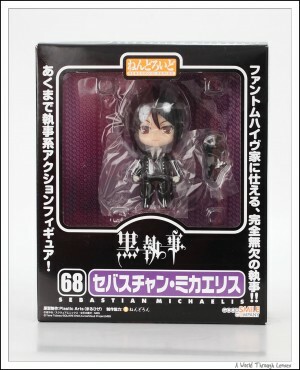 This is actually the standard face right out the box. 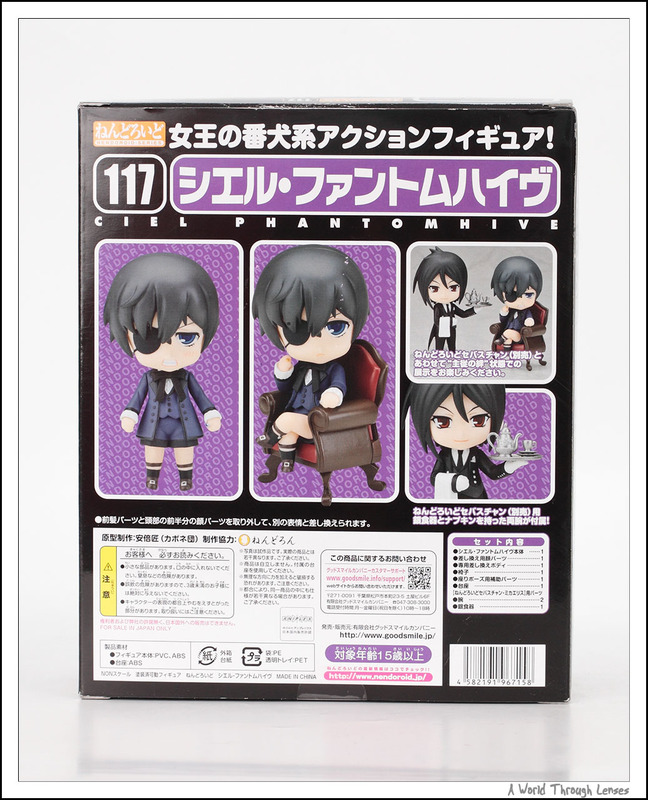 Inside the box of Ciel, it also comes with an extra set of hands for Sebastian complete with silverware for Sebastian to bring it to Ciel. Here’s Sebastian with the new parts for him. So here they are together master and servant. 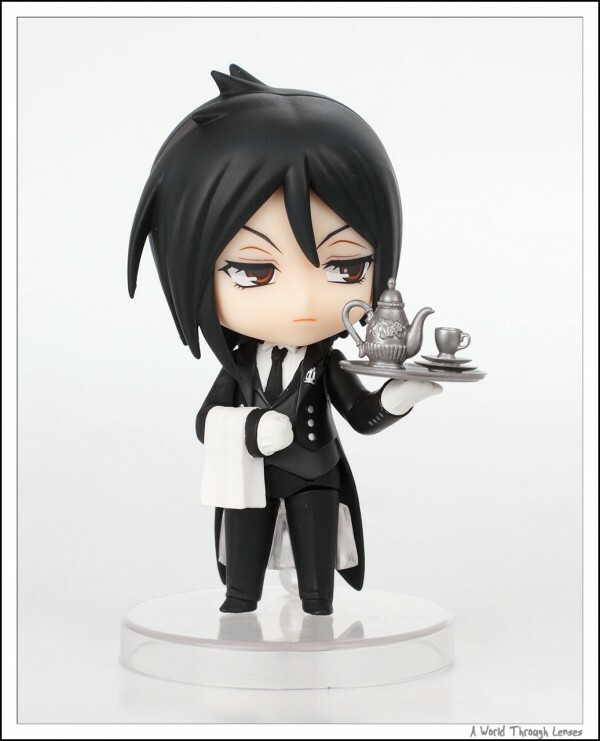 See how Sebastian is much more fitting as a butler now? Without the table cloth and the silverware, it just doesn’t feel complete. And a little something extra, here’s an omake. 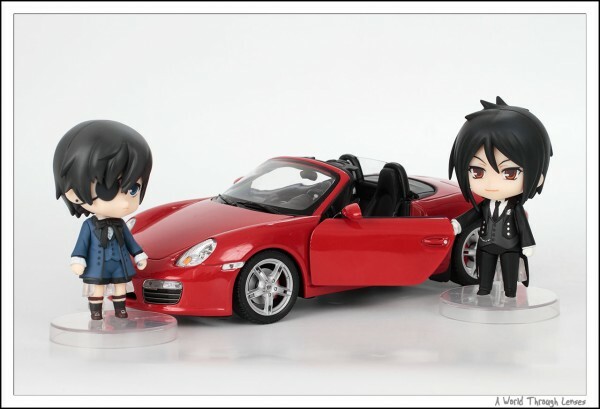 Ciel: Sebastian… Ready my carriage. Sebastian: Here you are, my lord. 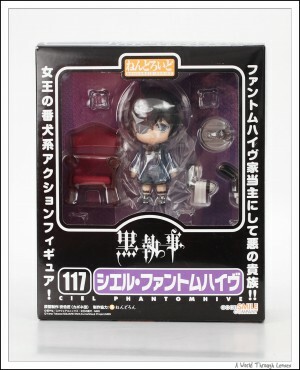 Ciel: What is this? Am I suppose to push this around myself? Sebastian: But it says it’s got over 300 horses. 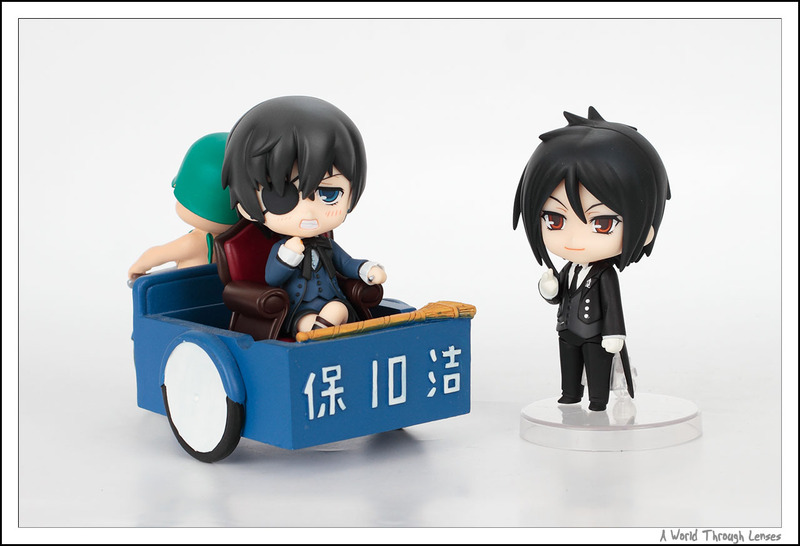 Ciel: I don’t see any horses here, my carriage needs to be pulled by something. Now get me a real carriage immediately! 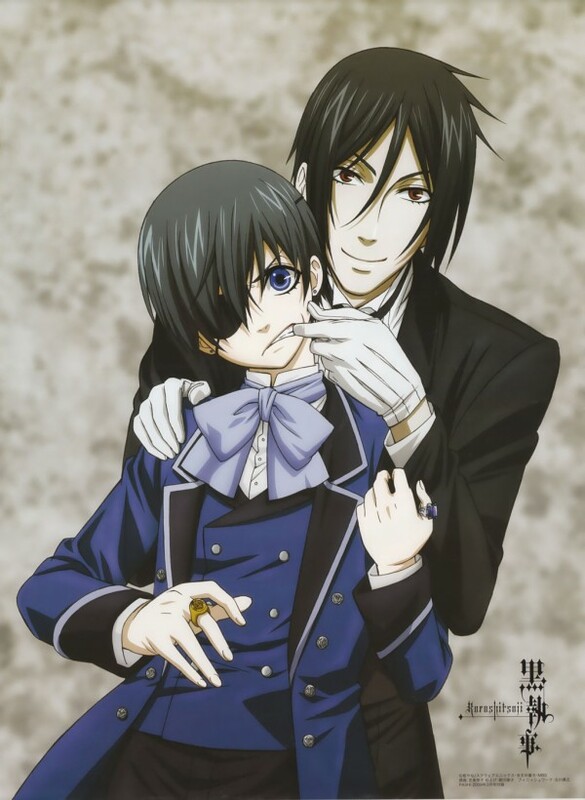 Sebastian: Here my lord, something that’s being pulled as you have requested. I’ve heard that it is just as good as the one I got you previously. 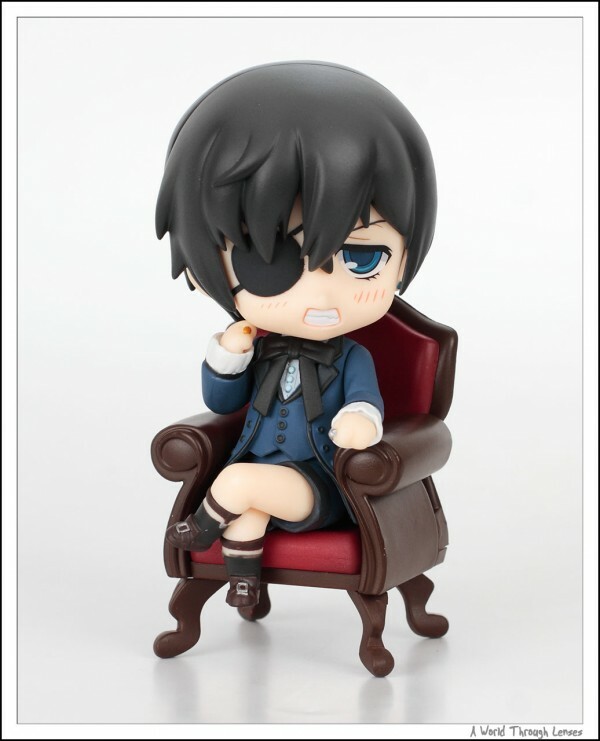 Wasn’t able to find a good illustration of Ciel sitting in his chair. 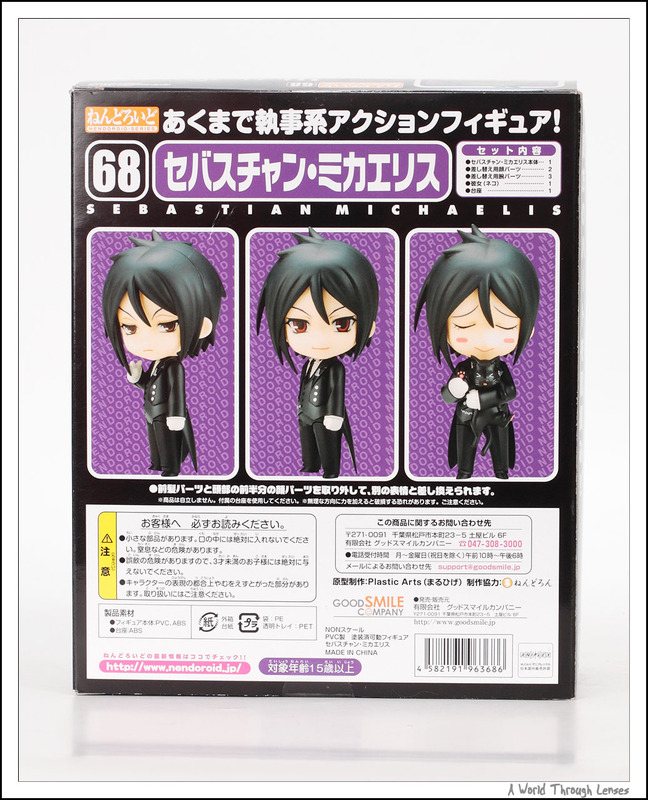 So this one together with Sebastian will have to do.